My 3rd virtual pet card --- ALL monkeys!!! 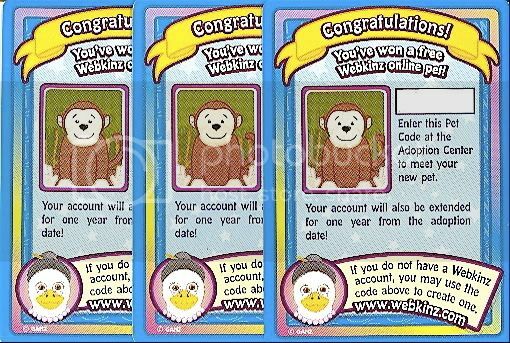 I have been buying full boxes of Webkinz trading cards (36 packs in a box) trying to complete the categories in the virtual folder and unlock those prizes. Good news is that after going through two boxes, I am now only missing 3 cards in the Trading Card group and 4 in the Challenge Card group. Also found one virtual pet card in each box. Unfortunately both virtual pets were monkeys. Adopted one and kept the other card until I could decide what to do with it. Today, opened up a 3rd box of Webkinz cards and in just the 2nd pack got another virtual pet. Yes, another monkey!!! Any suggestions what I should do? One monkey was OK, but I don't want to use all three!!! I am doing this for my little daughter's account and she only has 5 pets, including the first monkey we entered. How can I use the extra monkeys? I do have one idea but first I would like to hear if other people can think of a better solution. Re: My 3rd virtual pet card --- ALL monkeys!!! I'll take one. Just kidding! I don't know what to do with all those monkies, but I find it funny. Best of luck deciding! I think you should benefit from the jungle theme! you could have a contest on here and award a winner a monkey and mail it to them? that would be fun? you could list them on ebay and sell them code unused? you could trade them with someone who has other virtual pets? and hey, i like monkeys! I feel your pain! LOL! We adopted a frog so that we could have something different and then ended up with 2 frogs from trading cards. lucky you! I love the monkey, but never have actually gotten to see it in person. I have bought a few trading cards and have received some stuff...mainly food. So I hate to keep spending money on them when I have a garden so large it feeds all 3 of my webkinz and then some! My thoughts were maybe you could trade them for something you were looking for?? Just an idea though. I have found that the picture does not always match the virtual pet. I have three virtuals as well. The second one I got was a picture of a panda, but when we actually logged him on, we got to choose between a panda, a frog and a golden retriever! My sister and I have found three cards total so far and none of them were what the card showed. The first a panda picture turned out to be a frog, the second code said used so they had to give me a new code, and the third code was a monkey and it turned out to be a panda. You never know what animal you will get so name it something that can be used for whatever. This is true. I got one and it was a monkey too. Maybe in the second series it will be a different animal. My advice to you is maybe give one to a friend for her birthday or Ebay you could probably make quite a bit of money for a Virtual Pet card. You could save it and maybe one day you will come accross someone who really needs it! Good Luck, Let me know how you make out.